Teeth that are beautiful and straight inspire you to smile which gives off a great first impression. It can be difficult when deciding what route to take to straighten teeth and get that beautiful smile. 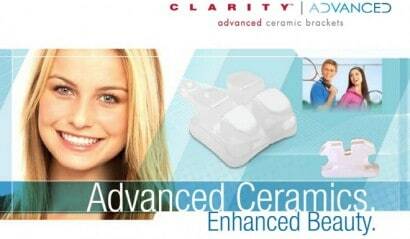 A great, new option to perfect your teeth is 3M Unitek Clarity braces which are made of ceramic. These are not like braces of the past and offer innovation to make them a wonderful option for many teens and adults. 3M Unitek Clarity braces are also much more visibly appealing. The brackets are translucent and can’t be seen from far away. The design allows the brackets to blend with the natural teeth color so that they are barely visible. The material is stain resistant and will not discolor during treatment. 3M Unitek Clarity braces are made to last and retain their integrity throughout treatment. The material is created through a unique injection-molding process that offers strength in a small profile. The ceramic is fine-grained and has sufficient space under the tie-wings to allow for needed adjustments and treatments throughout the duration of being worn. They are available with an APC Adhesive system to ensure they stay in place and the unique design allows for simple mesial-distal debonding. If you’re looking for a better way to straighten your teeth and get that perfect smile, contact McDermott Orthodontics in the middle Minnesota area. They provide a wide variety of orthodontics services to the areas of Baxter, Delano, Pequot Lakes and Brainerd, including ceramic braces, metal braces and everything you need to achieve the perfect bite and that Hollywood smile. Dr McDermott has a comfortable office with a friendly staff who are there to help you get that beautiful smile you’ve been looking for.